One obvious example of Iranian intervention in foreign affairs, and of the regime’s duplicity about it, is the Syrian Civil War. International organizations and national governments alike have assembled considerable evidence that aside from sending great quantities of weapons and military equipment to the Assad regime, Iran is also recruiting and transporting fighters to contribute to the war effort on Assad’s behalf. The IRNA news agency announced on Sunday that the state was conducting a ceremony to commemorate AbdollahEskandari, a General in the Iranian Revolutionary Guard Corps, who was killed amidst fighting in Syria. Iran claims that Eskandari was simply helping to defend the SayidaZeinabshrine, and that its forces are only serving in an advisory role. However, apart from the fact that there are IRGC war dead, it is understood that Iran has sent Iraqi volunteers to the front and that it has offered Afghan refugees money and Iranian citizenship to fight for Assad. Last week, Syrian opposition leader Ahmad Jarba met in Paris with Maryam Rajavi, the leader of the National Council of Resistance of Iran. The meeting may have signaled the potential for foreign support for the Syrian rebels, and the unity of opposition groups fighting against the two allied nations. There are signs, however, that they will face all new challenges when talks resume. Iranian Oil Minister BijanZanganeh has already rejected the limits to oil exports that were supposedly imposed by the interim agreement that was reached in November. 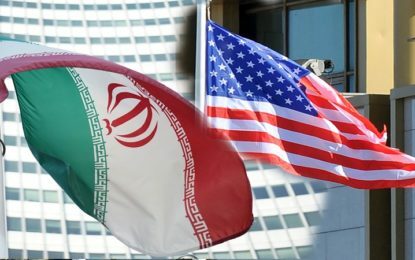 However, the Obama administration has steadfastly maintained that Iran would comply with the overall limits by the time the interim period ended. With exports having risen again in May, compliance is now a “mathematical impossibility” according to The Tower website. When pressed by journalists on the topic, State Department Spokesperson Jen Psaki rejected that claim, saying that there is a “range of data” to be looked at which might still support the notion that decreased exports in June could bring Iran in compliance with the agreement. However, Psaki’s comments may be self-defeating. If alternative data may show lower-than-reported exports for the month, it is equally possible that other alternatives may show those exports to be higher than reported. This is quite plausible in light of the fact that Iran has been known to evade sanctions by bartering for its oil exports and avoiding monitored international payment systems. This may still be occurring in spite of temporary sanctions relief.